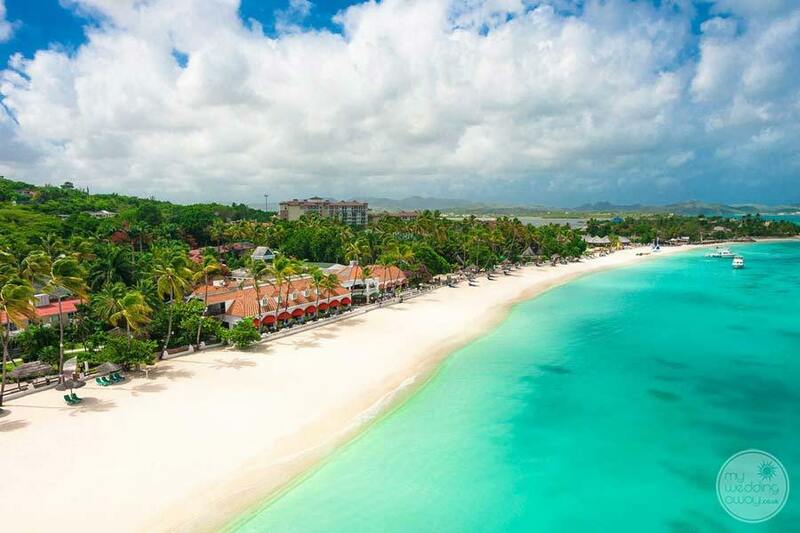 Ideal for: An exceptional adults-only property voted worlds most romantic resort year after year. 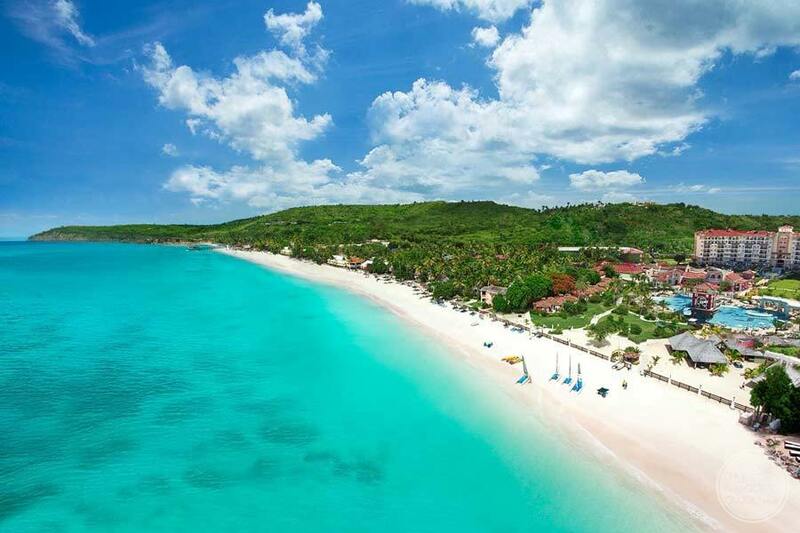 Look no further than Sandals Grande Antigua for your destination wedding plans. 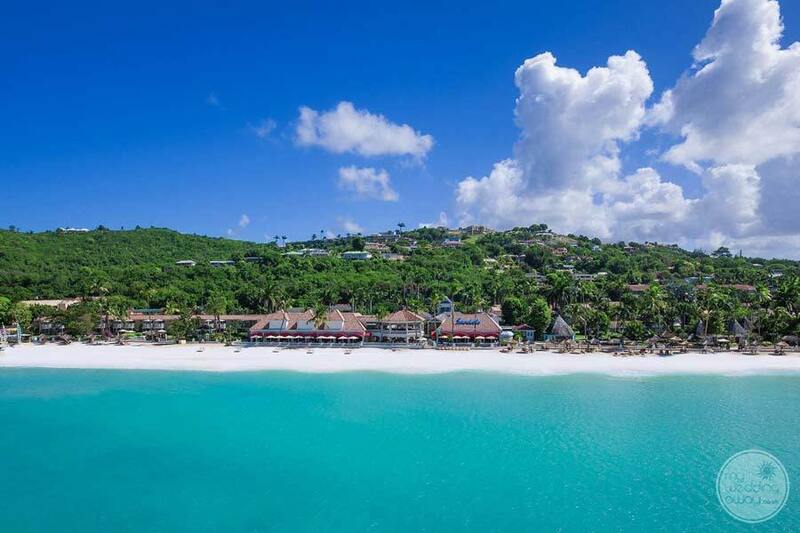 Located on one of Antigua’s very best and most famous beach, Dickenson Bay. 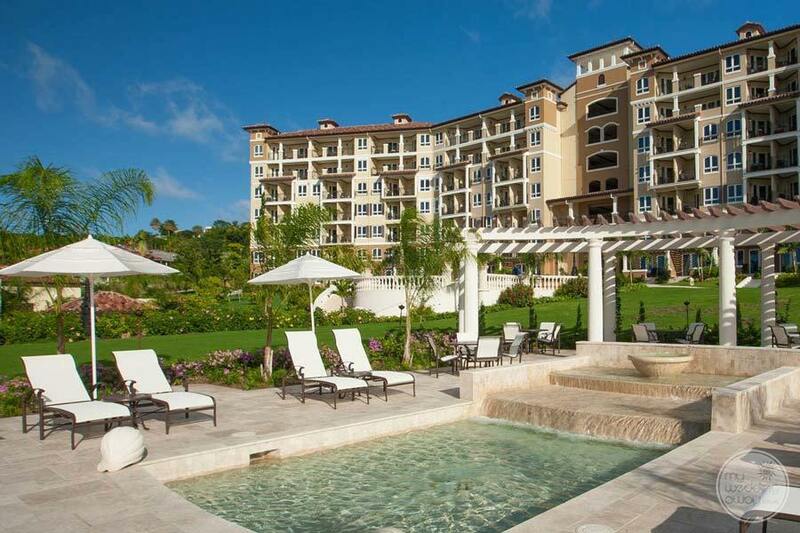 Once you step onto this beautiful property, you will never want to leave! 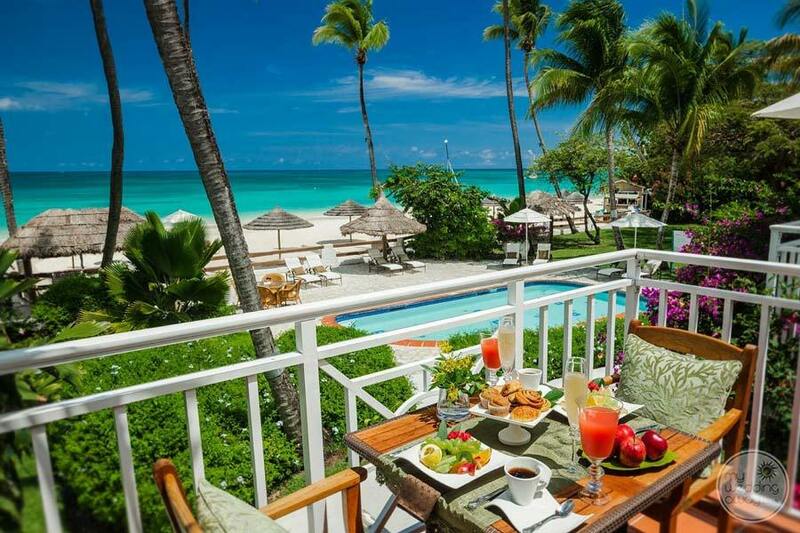 Rooms and suites at the Sandals Grand Antigua are uniquely set up between three beautiful villages. Here you’ll find accommodations that are elegantly decorated with flair and style and also very reminiscent of the Caribbean flavour. 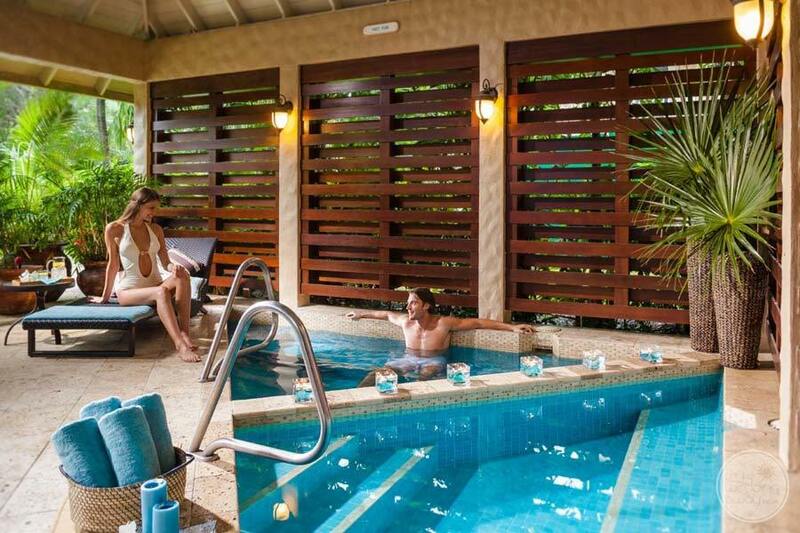 If your budget allows, then the Butler Villa is a must have with its private pool sanctuary perfect for a mini honeymoon after your wedding vows. 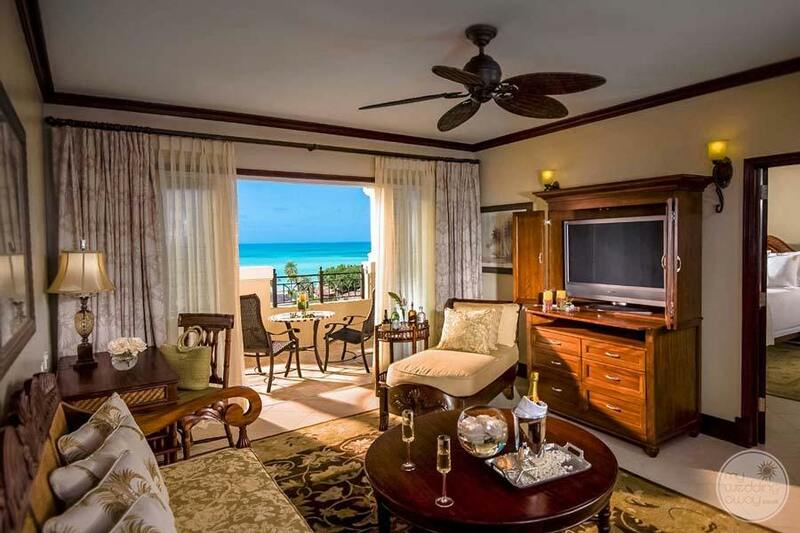 There are several rooms and suites to choose from depending on your taste and needs; every room comes fully equipped with all the amenities you would come to expect from a premier Sandals resort. 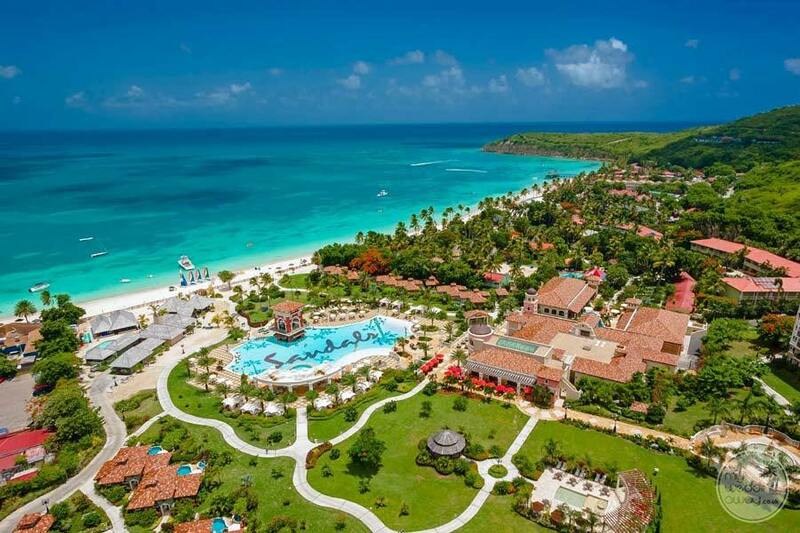 This stunning Caribbean Beachfront resort offers a natural garden oasis with meandering walkways surrounded by Majestic palms and beautiful sunsets. For ocean lovers, you can Scuba dive as much as your heart desires. A sea of water creatures is waiting for your fun-filled exploration. 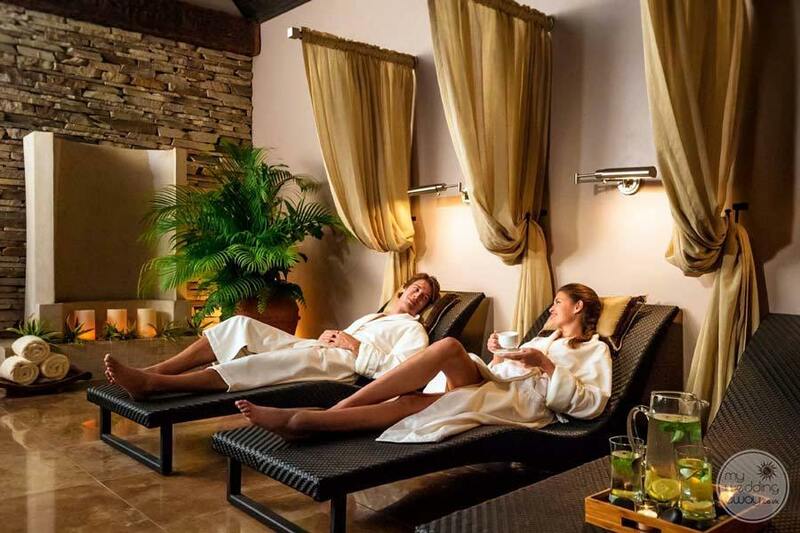 The Spa is a sensory playground with a multitude of different massage and beauty treatments, sure to get you relaxed and well prepared for your exceptional wedding date. Watersports and pool activities can be enjoyed throughout your stay. Want to work on your fitness program? 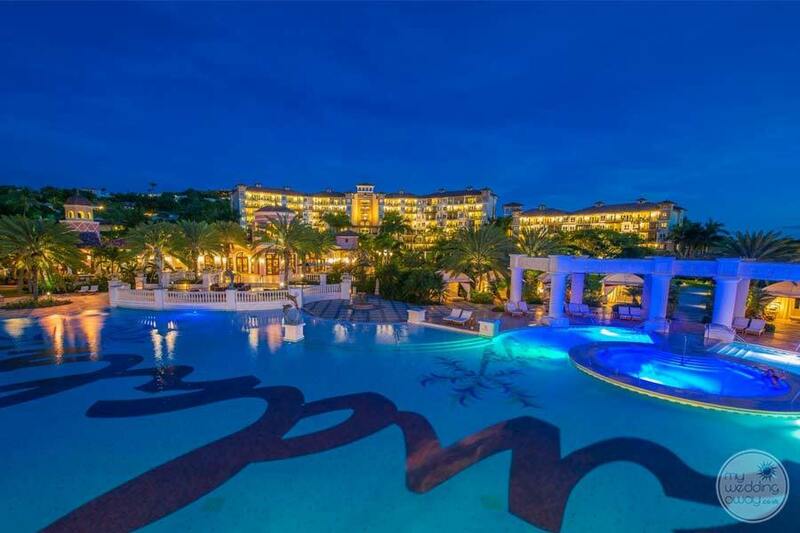 Then look no further than the fitness centre where you can burn off a few calories so you can indulge in fantastic resort evening dining served with chilled top shelf drinks. 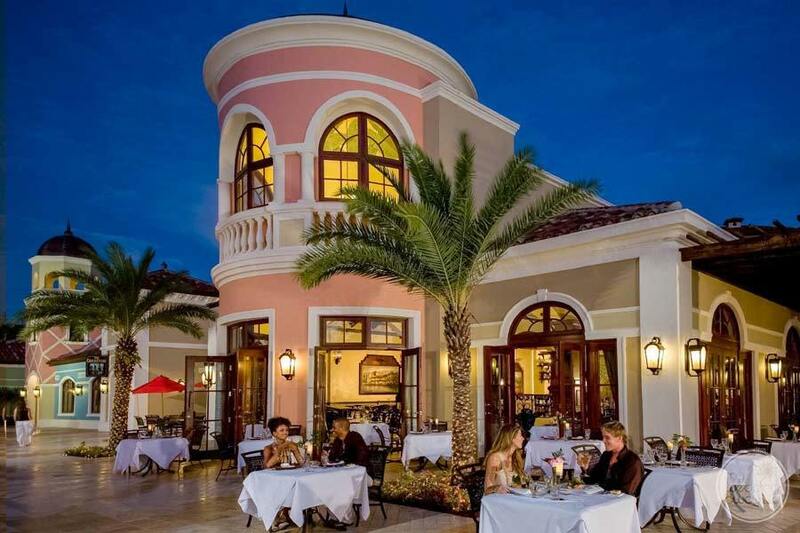 The food here at Sandals Antigua Resort is truly exemplary. 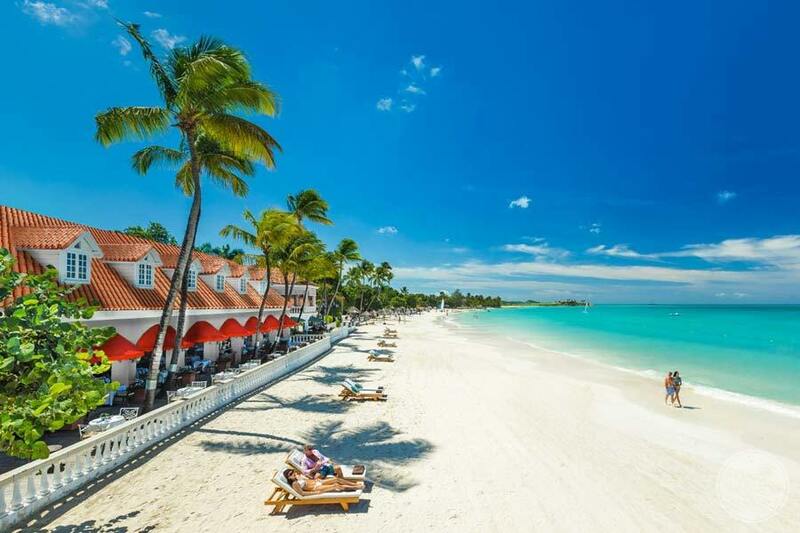 The team of chefs prepare a variety of delectable dishes that represent not only the best of the Caribbean flavours but also entertain and delight with an international flare. Taste the food sensations of Eleanor’s, where the food is prepared as hot as you can take it. 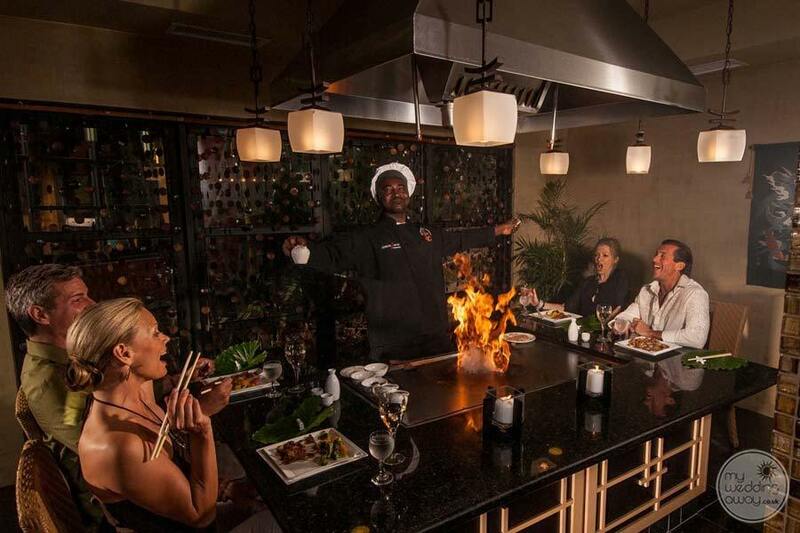 Kimonos is the perfect dining spot to experience some stir fry magic reflecting the best of Eastern cuisine. Finally, if you are craving pasta then you’ll love Mario’s where soft, warm bread rolls start your evening followed by all your Italian favourites. 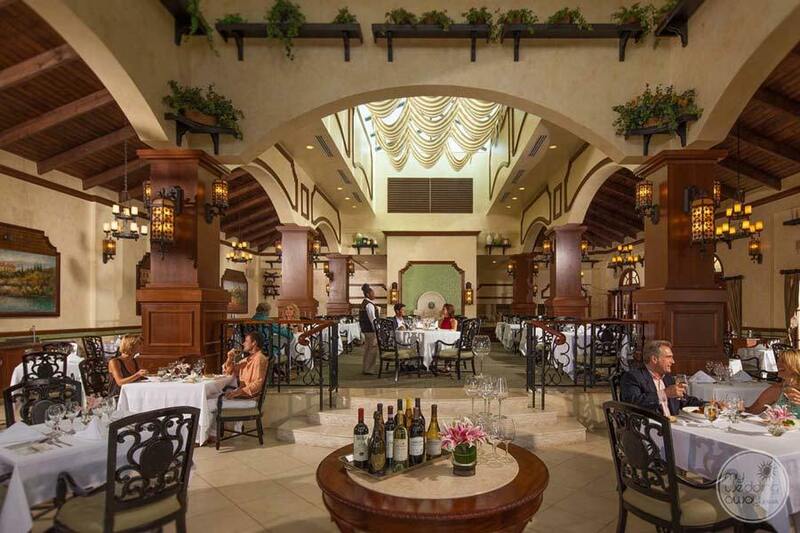 For wine lovers, they will genuinely appreciate the resorts desire to find the perfect wine pairing for all your dining pleasures. 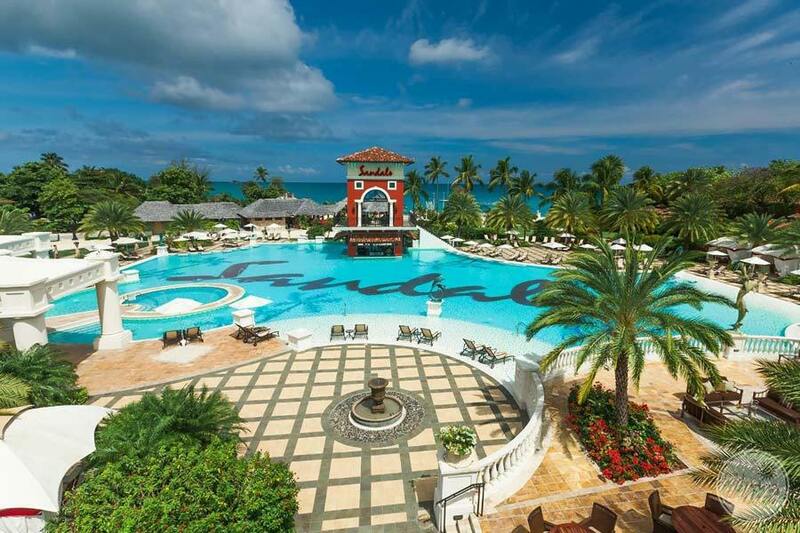 One of the great features of having your destination wedding at Sandals Grande Antigua is their dedication to making your wedding one of the most unique events of your life. 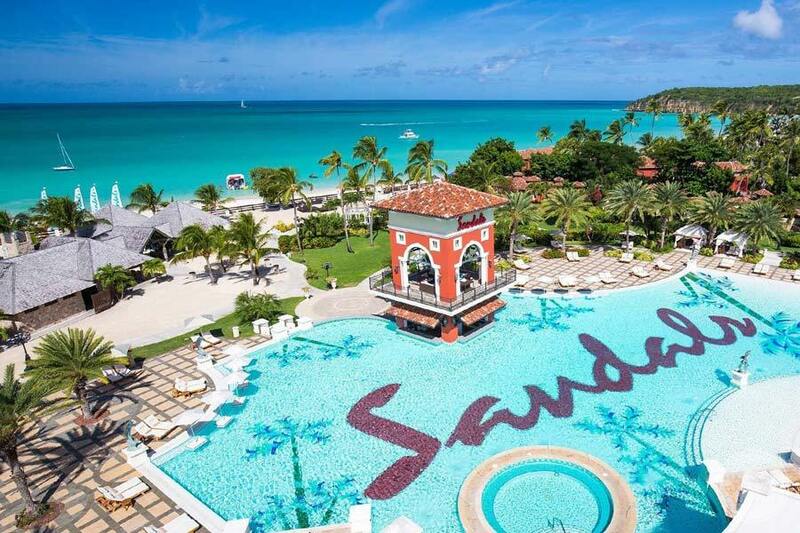 Sandals has a team of wedding specialists who understand each bride’s needs and work very hard to make your wedding vision a reality. 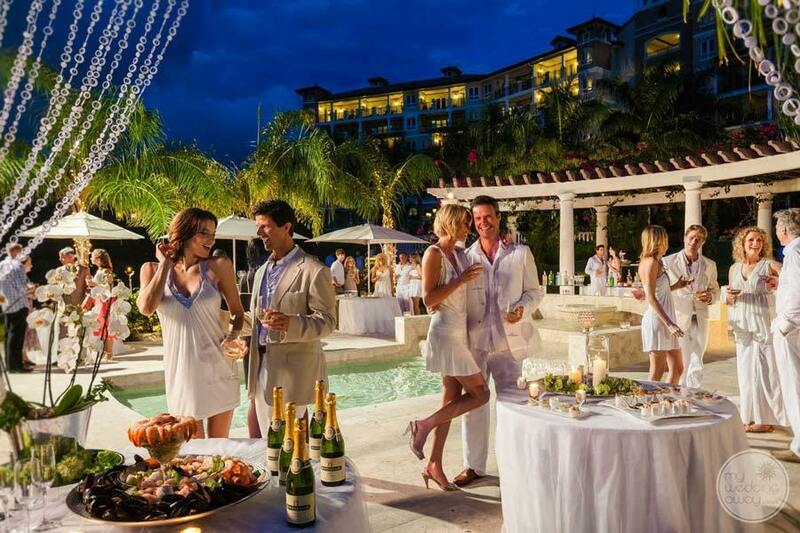 They have taken comprehensive wedding packages offered by most resorts and turned them into a truly custom experience. Each one unique to each brides wedding Wishlist. Tell them your wedding dreams and their planners will surely bring them to life!